I slowed down my blogging activity recently but a few of my ex-colleagues and friends in Melbourne asked me to continue writing about my US experience. So here we go - here is a 3rd blog post about some interesting things I came across here in the US. This is going to be an automotive edition. I've learnt that if you want to buy a car there are companies that would bring this car to you. From what I've seen, it is more common in a luxury/more expensive price segment. A potential buyer can just express interest, agree on a place and time to meet, and someone will bring this car there for you to perform a test drive. That's pretty cool, especially for busy people when they don't have too much time driving around dealerships around the whole Bay Area. Continuing on the cars topic - there are 3 passenger car models that are very popular here. In addition to Toyota Camry and Corolla I was surprised to see A LOT more Honda Civic cars compared to Australia. And while Toyota Camry was the best selling car in America in 2016 and 2017, Civic numbers look strong too. In fact, all 3 most popular models showing 30K+ sales figures in March 2018, with Honda Accord not too far away with 24K cars sold in the 5th place. This is a passenger cars segment (measured in units - I have a surprise later in this article in regards to another metric "by revenue"). But what I've discovered is that Americans love their trucks. A (pickup) truck here is not a "large, heavy motor vehicle used to transfer goods". Here it is more akin to a ute but bigger and more brutal/manly. Ford with their F-Series is a clear winner with 73K+ sold in April. There is also a lot of hybrid and fully electric cars (at least here in California). In fact, I came to a conclusion that the Bay Area lives in the future - about 5 years ahead of the rest of the world. Every morning I drive to work passing Fremont (where Teslas are made) and I see trucks loaded with Tesla model 3s taking them all over the country. There were already many Tesla Model S on the road 2 years ago. But since Elon fixed the production issues for Model 3 it's just incredible how many of those "baby Teslas" I see now. Just recently I was chatting with a colleague, who came from LA and he said that they didn't have that many Teslas over there. Another fully electric car that gets very popular is Chevy Bolt EV (not the Volt, which is a hybrid - the naming is quite confusing). 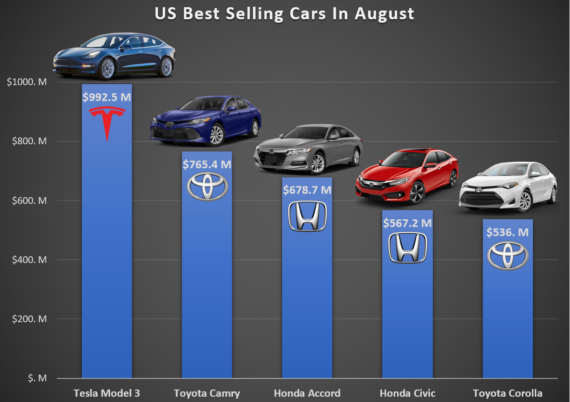 Top US selling cars by revenue. The car charging infrastructure is very well developed too. We have several places on the parking lots equipped with the charging stations. The owners of the electric cars have an internal Slack channel, where they maintain the line to make sure everyone gets a chance to charge their cars. Usually they agree on 2 hour time blocks. Hybrid cars are very popular here. There are 2 types - one that chargers the battery while coasting or breaking and another (called plug-in hybrid) that has an ability to charge a battery via a charge point station. The popularity of hybrids is explained by both California being super "green" (ecology topics are huge here) and purely because hybrids are cheaper to run (achieving fuel consumption of 36 MPG and better). Here I need to explain what MPG is: car fuel consumption is measured in miles per gallon (MPG) - a unit not only meaningless for the rest of the world but also being an inverse function (the larger the value - the better)! If litres per 100km was very natural and easy for me to understand, the amount of miles I can drive on a gallon of petrol (it's called gas here) is harder to "feel". I haven't seen weekly petrol price fluctuations. But petrol prices in San Francisco can be a dollar higher (per gallon) compared to San Jose. To give you an idea, at the time of the writing, petrol prices in SF are around $4. I have a soft spot for American muscle cars. They look great, they are powerful (especially in the straight line performance) and they are not that expensive. I see a lot of Mustangs (my favourite), Chargers etc on the road and this brings smiles to my face. Another novelty was the "Spare the air" campaign. Basically it's an organisation that monitors air quality and issues spare the air alerts encouraging motorists to leave their cars at home and use public transport instead or carpool (when each car has to have more than one occupant). I'd like to say a few words about the car search web sites. There are generic classifieds web sites (like autotrader, cars.com, CarMax, TrueCar, various dealers' sites etc). They are doing their job, it's a great a starting point when start exploring some options. I see some innovation too. But having worked for Carsales in Australia (which obviously makes me biased) I have to say that Carsales' search is the best I've seen so far. The richness of the search interface is just amazing compared to some other sites that I've used recently. Craigslist is quite popular too - especially in the cheap used cars segment. But that interface... seriously?! Thank you for reading! As always, please leave your questions and comments below.